Huawei : Ascend Y300, G510 … and much much more…. HTC : HTC One,S,V,Sensation XE XL,First, ThunderBolt,EVO 4G, Inspire,Vivid,Wildfire,Desire,Windows Phone 8X…. We assure you that we will try our best to satiate your needs and resolve issues. 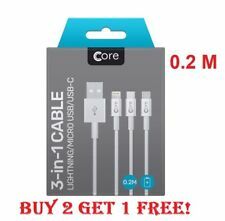 USB to Micro USB. USB to USB Type-C. USB to Apple 30 pin. 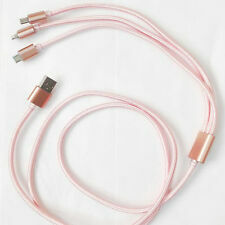 USB to Apple Lightening. Compatible devices; 8 pin connector for iPhone 6 Plus/6S Plus/6/6S/5/5S/5C/SE, iPad Air, iPad mini, iPad 4th gen, iPod Touch 5th Gen, iPod Nano 7th Gen; 30 pin connector for Apple iPhone 3G, 4G, iPad 1, 2, 3; Micro USB 2.0 connector for Samsung GALAXY S2, S3, S4, Note 2, HTC, SONY and Most Android phones; Micro USB 3.0 connector for Samsung GALAXY S5, S6/edge/edge plus, Note 3, Note 4. Huawei : Ascend Y300, G510 … and much much more…. HTC : HTC One,S,V,Sensation XE XL,First, ThunderBolt,EVO 4G, Inspire,Vivid,Wildfire,Desire,Windows Phone 8X…. Apple : iPhone X, iPhone 3G, iPhone 3GS, iPhone 4, iPhone 4S, iPad 1, iPad 2. 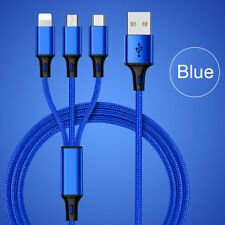 Universal 3 in1 Multi USB Charger Charging Sync Cable for Android Type C iPhone.